As many know the CISPA bill has been passed, and as many know the CISPA bill violates privacy rights. It Violates our right to free speech, it censors the truth, and it does affect the Animal Advocacy Activism world. Although there are certain area's of this bill I agree with, like reporting criminal behavior or terrorist like threats. It Violates the constitution because it effects people like us who dig in the dirt to save and spread truth about the animal world... This would ultimately affect, A.L.F,Anonymous, Voices For The Breeds owners and admins, The 4A groups and so on. Does our personal information really need to be giving out to people who could do inconsiderable harm to us and those who are on the side of animals? I say NO! We are doing the job that we were put here for, TO PROTECT THE ANIMALS RIGHTS, To BUST the animal abusers, frauds, and shady people. To free animals from their cages without being prosecuted in the process! This is our right, it is our job to have the freedom to protect our furry brethren! Our Names are hidden for a reason, to protect our identity so we can continue to inform others about those who do wrong. Our identities need to stay private so we don't become a Victim of harassment, stalking, or worse. 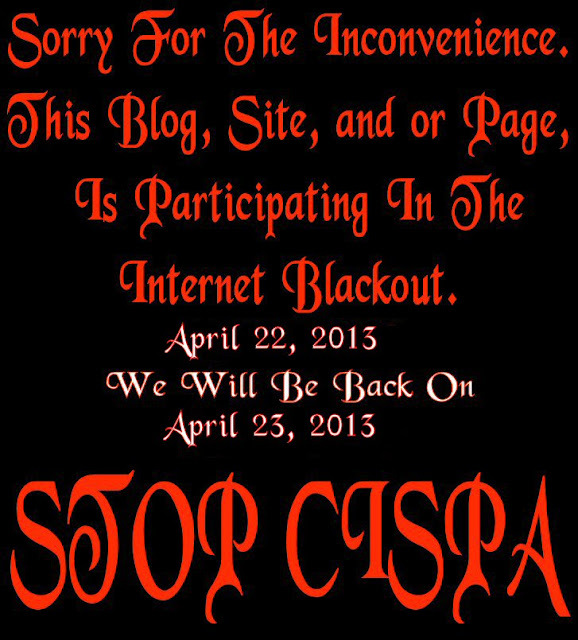 So here we are, we are in support of the Internet Blackout, If you agree take this into consideration. No posting, no sharing, and no going on any social media networks. Voices For The Breeds page will be silent, no posts will be made, no sharing will be done. Until the 23 of April. The Page will be Unpublished on April 22 and put back up on April 23. The same goes for this Blog. The only thing people might see is this picture below. Once again thank you all for the support and understanding.